OAKLAND, Calif. (KTVU) - On a brisk morning before the sun rises in Oakland, a group of investigators with the California Department of Motor Vehicles set their sights on disabled parking spaces and placards, hoping to send a message that misuse and abuse of the placards is not only against the law, but prevents those with actual disabilities from getting a close place to park. For decades, there has been a problem with people misusing and abusing disabled parking placards and despite a hefty fine, investigators who enforce the law and look for the misuse, say they’re fighting a losing battle. The obvious perk of using a disabled placard is you have a close place to park. But in California, these placards can also score people free parking at any meter for unlimited time. While it’s illegal to use someone else’s placards to park, it happens every single day in the Bay Area. The California Department of Motor Vehicles has issued 2.9 million placards across the state and estimates one in 10 are being misused. In fact, 2 Investigates found some disabled placards are being sold right now on eBay for roughly $60. Licensed doctors must certify in writing a disease or disability before a placard is issued. While it is given to a specific person, it doesn’t protect against fraud. DMV investigators target one enforcement day a month in each of its 24 districts, which means places like Oakland may only get checked a couple times a year. In major cities like Oakland, San Francisco and San Jose, the fine for misusing a placard is $1,105 with half of the fine going to the city and the other half to the county. Still, the placards clearly say the maximum fine is $4,200. California law says it is a misdemeanor crime and goes on a driving record. Also, the person who was issued the placard must be riding in the car in order for it to be considered valid use, however, it doesn’t stop the abuse. 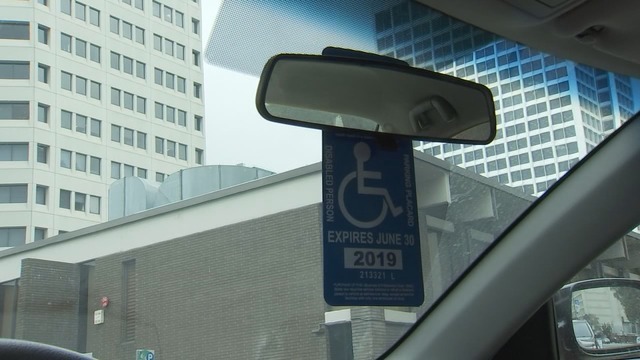 When 2 Investigates went with investigators in Oakland, at least three people were using their parents’ disabled parking placards for free parking at meters. In one case, a man was caught using his dead mother’s placard. That kind of abuse and disregard for the disabled is upsetting to people who depend on the close space, even if their disability isn’t clearly visible. When an investigator checks for misuse, he or she will run the license plate number, the placard number and also ask for the receipt from the placard, which is required to stay with the person or placard at all times. Additionally, if someone passes away, it is the family’s responsibility to return the disabled parking placard. There are new efforts to use death certificates to week out placards but the low number of investigators still makes constant enforcement a challenge. If a person is caught misusing a placard, it is taken by an investigator and the person for whom the placard belongs will have to go back to his or her doctor to get a new written certification before the DMV will issue a new placard. To report abuse or fraudulent use of a disabled parking placard, click here.